11th Welcome to our Off Track Family “Legacy B”! Get your buckets out! This one is totally drool worthy! 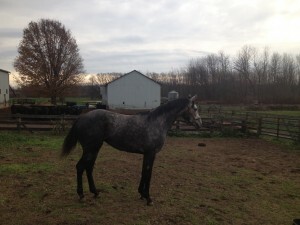 2 weeks ago I posted a picture of my horse Oz, and his pedigree in an Off-Track-Thoroughbred group (Facebook). It was “post your pedigree” day and everyone was joining in, posting whether they owned a sibling, cousin, knew the horse when it raced, knew the trainer, past owner, or simply thought the horse was dashing. All innocent fun, right? It was great to learn about my horses bloodlines, and that his great grandsire BailJumper was both a racing and jumper stallion. I already knew about his dad’s (Skip Away) $6.9 million Hall-of-Fame earning winnings on the track, but I didn’t know how many fans he had. There was something else I didn’t know about his dad, and I received a notification an hour after I posted that caught my attention. It was in regards to his 2010 colt who was running his last race that week. Sue, who is involved with CANTER PA (Thoroughbred re-homing charity organization out of Pennsylvania), knew of my horse Oz’s half brother who was coming up for sale the next week. I privately messaged her and said something like “Thank you, but I really need another horse right now like a fish needs a bicycle. Oz likes his title of most spoiled horse in the barn, and intends to keep it”. Sue replied with the contact information for the owner, giving me a 1 week head-start on everyone else (and reminded me it wouldn’t take much to have the most spoiled horses in the barn). I don’t know how she knew, or where she went to school for match-making, but a few emails/phone calls later I was the proud new owner of “Skippy” and the paperwork was being done for him to cross the border into Canada. Colour: Dapple grey with a “irregular star” and whorls everywhere. Seriously, he looks like he has cow-licks all over his face. It’s super cute. Personality: He walked right on the trailer, backed right off, went into his stall and dunked his entire nose in the water bucket. His head came out of the water bucket with a huge splash and I thought to myself “Oh great, he’s going to scare himself and be afraid of water forever”…. Nope, he stuck his tongue out at me, dribbled water all over and started munching on hay. The next day he went outside, met the rest of the herd and explored his pasture. Galloped around a bit, cut some cows, tested the electric fence once and learned the pecking order (he’s near the bottom, and that’s totally fine with him). I think he’s going to be pretty easy to get along with! Name (s): I decided to call him Legacy B. Skip Away, his sire had a heart attack in 2010, leaving the future of his fame in the hooves of his offspring. Since Legacy B was born in 2010, he really is Skip Away’s legacy. The “B” comes from his dam’s name “Wake up Maggie B B” as well as my step-dads name, Brooke. Brooke has always supported my riding, and reminds me to never let a great opportunity slip away. Since naming him Legacy B, we’ve started calling him “Lego” for short. It suits him, because all the pieces fit together perfectly! Future Goals: I’ve never been one to plan a horses future. Maybe it’s because I’m not that competitive, and don’t have any goals for showing, but I really don’t like putting pressure on a young horse either. I do know that he’s going to be well taken care of, and whatever he wants to do is fine with me. I’d love to do some dressage with him next year, and introduce him to eventing to see if he likes it. For the next little while well he grows up, my partner Ben is going to take him out on trails and show him the beautiful Canadian landscape.